Pandora is one of the most popular free streaming music service that allows you to listen to the most popular music. However, recently, Pandora has decided to limit users free music time at 40 hours a month on mobile devices. Plus, it requires Internet connection when it is working. In this case, why not download music from Pandora to listen unlimited amount of songs offline? Following are easy steps to free download, record songs from Pandora Radio. How to download or record music on Pandora? 1. 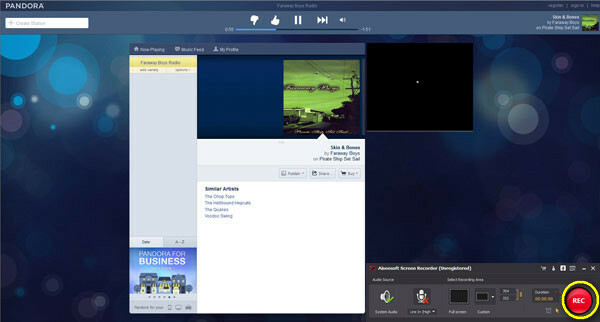 Log in Pandora in your browser on PC, find the music that you want to download, play the music on Pandora to check if it is the exact one. 2. Download, install and double click to launch this Pandora music download program on your PC. 3. Click Microphone button – from “Audio Source” option, to turn off it like this – . System audio means the audio are from the computer system itself while microphone audio shows the audio from outside of the computer. Since you want to download the music from Pandora, and it is from the computer system, you need to turn on system audio to record the music sound and remove the noise from outside of the computer. Remove the sound from outside, and keep the system audio. 4. Navigate to the starting time when you want to download the music from Pandora. Click “REC” to start. The recorded video will be saved in the format of WMV, and you could playback the recorded Pandora music in your computer with Windows Media Player. By now, this process of recording free Pandora music has been completed. Try to record your favorite music from Pandora by yourself. If you want to play the music on your portable devices, like iPhone 6s/6s Plus, iPad Pro/Air 3, Samsung Galaxy S6, etc., then you can convert the recorded WMV video to audio format, like MP3, AAC, AIFF, M4A, etc. The method is easy enough to use an audio converter to convert video to audio. What other functions about UFUWare Screen Recorder? ◆ This program enables you to download the audio from system and microphone. ◆ The recorded audio is lossless and you can enjoy a high quality music trip. ◆ It has no limitation of time for your total recording process. You can record as long as you want. ◆ It allows you to set the recording time for starting and ending, also you can take a screenshot for your interested image by pressing F8 in your keyboard. ◆ Apart from audio, you could record video (including HD and 4K) to save in PC for playback. ◆ The simple interface makes you follow the steps easily, even if you are a fresh hand. This program is powerful enough, and it provides free streaming audio and video recording. Equipped with it, you can entertain yourself with massive music and video online for playback on your personal device.